End of life seems like a scary topic, but many older adults actually feel relieved after sharing their wishes. After all, most seniors don’t want to burden their families with those tough decisions. 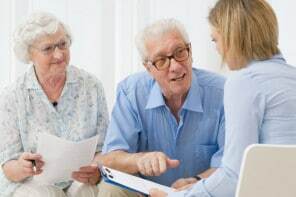 A living will or advance directive helps you understand and legally document your senior’s wishes for end-of-life care. Doing this before a health emergency saves you from making those hard choices in the middle of a crisis. Five Wishes is the most commonly used living will form in the U.S. because it’s written in plain language and uses a straightforward Q & A format to help put end-of-life wishes in writing. This form helps families in uncertain situations because it focuses on the fundamentals that matter most, like values and personal goals, rather than on specific treatments or medical procedures. See a sample Five Wishes document here. If you’d like help starting the conversation or filling out the form, Five Wishes also offers helpful guides and videos. Five Wishes isn’t a confusing legal document. It has clearly worded questions and states choices plainly. Using this document is so much easier than trying to create one from scratch. Each section includes common end-of-life preferences, which can be used as is or changed to suit your older adult’s wishes. There’s also room for anything they’d like to add. Five Wishes is very affordable. The form costs $5 plus the fee for a notary public to witness the signatures ($10 in California). In 42 U.S. states, completing the form and getting the signatures witnessed makes Five Wishes a valid legal document. Page 3 of the sample document shows which states accept it and why you might want to complete it even if it’s not legally valid. Since 1997, over 25 million Americans have used Five Wishes and more than 40,000 organizations endorse and distribute the document. It’s even available in 28 languages! Five Wishes focuses on personal values and how your older adult wants to be treated at the end of life. The inexpensive cost, plain language, and translations in many languages makes this form a great option. Even though we like Five Wishes, it’s only one type of living will document. Check with an elder law attorney if you’re not sure this form is right for your older adult’s situation.